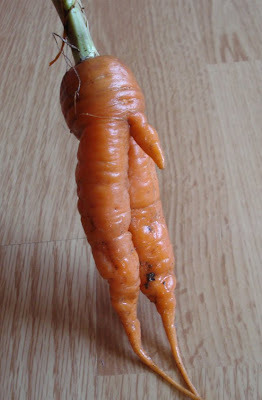 Rude Vegetables : I shall briefly suspend my more intellectual blogging to post you a picture of a rude carrot Gabrielle picked from the potager the other day. The thing with carrots is that they are delicate creatures and whenever their descending roots encounter an obstruction in the soil (a stone, for example) they are easily diverted or bifurcated. That’s no good if you want to sell them to a supermarket, where they all have to conform to the standard length and straightness coefficient, but great fun if you want to have a schoolboy-ish snigger. I seemed to have missed your last post. Thanks for it as does give lie to the fact that most farmers only view their livestock as cash on legs. I remember the pyres of a foot & mouth outbreak in Wales in 1960 - or thereabouts. Of course, I was too young to understand the significance but remember my parents being upset. Love it..I'm sure it's even tastier than the less gnarly. By coincidence I have just posted a couple of perverted tomatoes myself..